The most successful fighter of WWII, the P-51D Mustang still thrills thousands today in air shows and air races around the world. Now anyone with a Spektrum or JR 2.4GHz DSM2™ aircraft transmitter can experience Mustang thrills with this 4-channel ultra micro flyer that’s small enough to fly in the local gym or right in your very own backyard when winds are calm. For minor repairs use foam safe CA (EFLA208) or clear tape. 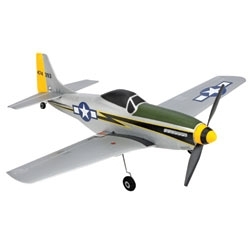 A DSM2 compatible aircraft transmitter is required to complete your P-51D Mustang.